For use in coloring pulps, this liquid retention agent enables the pigments to adhere to the pulp, ensuring a color's full intensity and eliminating any need to rinse the pulp. We have developed an outstanding pigmenting system, using this retention agent to ensure that pigment and pulp are completely bonded, and there will be no bleed to the finished paper or art work. We now use a new retention agent which is clear in color and needs no refrigeration. 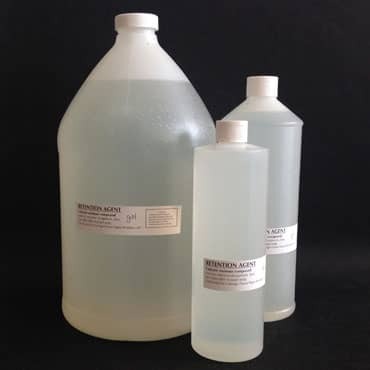 It is a resinous cationic liquid in a concentrated form and should be diluted in water before using. In order to know what quantity to order, figure on the same quantity of retention agent as the amount of pigment you require. Complete directions can be found on our website if you click on 'resources' on the top of our homepage.